Hidden amongst a vast sea of ceramics in towering glass cabinets within a maze of elongated rooms under the roof of the Victoria and Albert museum, lies an 18th century patch-box. What first drew me to the item was its beautiful colours, most striking of which is the red of Egyptian jasper. Not only are the colours enticing, but also the way in which it is moulded in relief. Peering closely into the glass cabinet, I could just about make out the intricate images of a hunting horn and a dead hare on its lid, accompanied by the inscription: ‘A la chasse des belles’, which roughly translates as ‘the hunt for beauty’. Perhaps it was a gift to a woman who took pleasure in hunting, or maybe it suggests that the patches within the box help towards a lady’s search, or rather hunt, for perfection and beauty. I wondered at why such an attractive and luxurious looking item was not given a more prominent position in the museum: did the curator not think it fair on the other ceramic items which may hold equal value or does its positioning suggest that a present-day visitor has no particular interest for such porcelain items? In any case, from that moment onwards, I became deeply curious about its history and how it came to be in its current location. After much research, I discovered that avid collector Lady Charlotte Schreiber had donated it along with 1,800 other ceramic pieces. The box would have been home to black patches that were once worn by wealthy men and women to conceal blemishes (before the days of concealer!). One nineteenth-century writer, Anna Jameson, even went as far as to say that patch-boxes were indispensable upon a lady’s dressing table. Could this statement be true? Certainly, Samuel Pepys makes countless references to the fashionable use of these silk patches in his diary. On the 5th May 1668, he recalls how Lady Castlemaine ‘called to one of her women … for a little patch off her face, and put it into her mouth and wetted it, and so clapped it upon her own by the side of her mouth, I suppose she feeling a pimple rising there’. Were these patch-boxes really once the centrepiece of a woman’s dressing table? It is almost too tragic to fathom that a piece that once had pride of place in someone’s home is now unappreciated, unused and perhaps worst of all, unloved. Although we can glean rather a lot from this item, where Schreiber discovered it will always remain a mystery. At first, it may seem bitterly disappointing that we may never know, but in fact I find that it adds even more allure and appeal to the item. And so the entire history of this charming little patch-box may never be known, but what I hope I have achieved is to re-establish some level of its original importance and meaning. By no means is it the only piece that needs restoring to its former glory so please, should an item that appears lost ever catch your eye, do take a moment to consider, or even research, what possible sociability it might have once had. 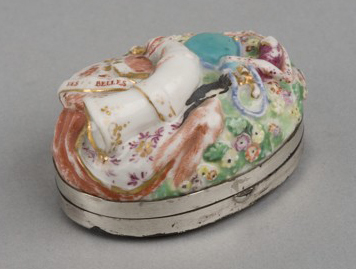 Item Details: Chelsea porcelain, Patch-box, item number 414:273-1885, Victoria and Albert Museum (Chelsea Porcelain Factory, London, ca.1759-1769). For further reading: The School for Scandal and Other Plays (Oxford University Press, 1998). Written by Richard Sheridan, this comedy was first performed in 1777 around the same time the patch-box was made. Perhaps the fictional character of Lady Sneerwell would have had one on her dressing-table?